The howler monkey is deceptively named. Its call isn’t so much a howl as a roar – and a deep primeval roar at that. “Ancient Mexicans thought they could hear the devil,” said Miguel, our guide, and you could hardly blame them. The jungle enveloping Yaxchilan is so dense and – with the exception of the bellowing primates – so silent, that the sound is unnerving. The Mayan city of Yaxchilan is the very definition of off-the-beaten-track. Deep in the south of Mexico, the ruins are several hours’ drive from the nearest hotel and can be reached only by boat, a rickety thatched-roof affair that chugs along the Usumacinta River with Mexico on one side, Guatemala on the other. But its remoteness meant we had the place to ourselves. Miguel led us through the series of dimly lit stone passageways that make up Yaxchilan’s entrance before we emerged into an emerald-green clearing of hanging vines, human-sized leaves – and ruins as far as the eye could see. It felt like stumbling upon a secret kingdom. Health and safety – and, come to think of it, any sense of preservation – were put to one side as we clambered over crumbling palaces and temples. Many of the millennium-old carvings that decorate these buildings remain remarkably intact and depict deliciously exotic scenes: of a king wearing an elaborate feather headdress and wielding a stick of power, say, or of crocodiles and jaguars, both native to the region. Meanwhile, Miguel enlightened us with tales of Mayan life – and the Mayans’ very bloody history. The city of Yaxchilan was at the peak of its power between AD 681 and 800; as at many Mexican sites, excavation is still a work in progress. Even though the Mayans were perceived as more cerebral than the warmongering Aztecs, they were big on human sacrifice. One of their favourite pastimes was a ball game in which the winning team was sacrificed to the gods. Sacrifice was considered a great honour. Our two-week trip began on the Yucatan peninsula. This is a region of considerable charm with wonderful wildlife (pelicans, flamingos), pretty colonial towns and endless white-sand beaches. But we soon discovered that Yucatan is Mexico-lite. Chichen Itza, for example, may indeed be a once-in-a-lifetime sight (and is often referred to as one of the new Seven Wonders of the World), but when we arrived it was chock-a-block with coaches and so commercialised that we half expected a branch of Starbucks to pop up from behind a pyramid. As you can imagine, no clambering was allowed here. Chiapas, on the other hand, really got us hooked. Mexico’s southernmost state is one of its least visited, despite its capital, Tuxtla Gutierrez, being just over an hour’s flight from Mexico City. But San Cristobal de las Casas – Chiapas’s cultural capital – is where you really want to be. This is a gem of a colonial town, 2,190 metres above sea level and surrounded by cloud forest, so it can be unusually chilly for Mexico. In The Lawless Roads, Graham Greene’s 1939 travelogue, he described San Cristobal as a place of “low single-storey houses with brown-tiled roofs and little flowery patios, the mountains crouched all round like large and friendly dogs”. Little has changed. The Crayola-coloured, low-slung houses remain (though with VW Beetles zipping down the streets these days) and the patios are just as flowery, even if many double as art spaces or ad-hoc cinemas. This felt like the real Mexico. San Cristobal is wonderfully walkable, its cobblestone streets the ideal setting for getting lost. The main street is the pedestrianised Real de Guadalupe, and an afternoon spent in one of its pavement cafes (preferably with a glass or two of red wine to hand) is the best seat in town. All life, however quirky, is here: from the shoe-shiners and flower-sellers to the chihuahua dog-walkers and the mariachi-band members with their gaudy outfits and perfectly groomed moustaches. Another must – and just as offbeat – can be found in the neighbouring village of San Juan Chamula. San Cristobal is at the heart of one of the most indigenous regions of Mexico – around a quarter of Chiapas’s population belongs to an indigenous group, the descendants of the Mayans making up one of the largest. 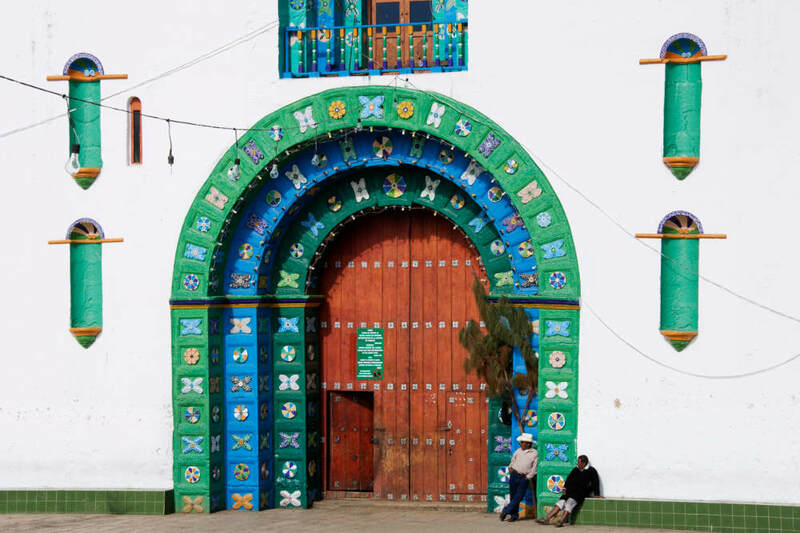 In San Juan Chamula you will find the Tzotzils, who follow a form of Roman Catholicism mixed with pre-Hispanic beliefs. And a visit to their church, the Templo de San Juan, ended up being one of the most unusual, and hypnotic, experiences I have ever had. The interior of the church is illuminated by thousands of candles. There are no pews and no priest; instead families in traditional dress gather on the floor. Cross-legged, they invoke prayers while making offerings of flowers, cans of Coke and, occasionally, live chickens. All the while a haunting and repetitive dirge is played on an accordion. The next day the sensory overload continued as Miguel and his minibus took us farther into the Chiapan countryside. The landscape changed at every turn, from verdant, steep-sided valleys covered in pines to tropical jungle. We drove through dusty villages filled with dogs, chickens and turkeys, with locals by the road selling mangoes and corn to passing vehicles (usually a pickup truck with half a dozen Mexican men swinging from the back). That night, we found ourselves at Valle Escondido, a ranch that has been converted into a cabin-style hotel. Willy, the owner, has lovingly – and expertly – built each of the eight rooms himself and the result is impressive: high ceilings, huge windows overlooking the valley, and an inviting hammock on every veranda. Like many non-indigenous people, he moved from the north 20-odd years ago as part of a push to bring more people to this remote, but beguiling, part of Mexico. Dinner – alfresco under a starry sky – was a home-cooked feast of fresh fish and tamales, a comfort-food concoction of corn and tender beef steamed in leaves. Content, we collapsed into our king-size beds in preparation for the following day’s drive – another long and snaking one to Yaxchilan. But Chiapas is worth it. This is a beautiful and intriguing corner of the world where the people are welcoming, the food is fantastic and the sights are awe-inspiring. This article was written by Charlotte Williamson from The Daily Telegraph and was legally licensed through the NewsCred publisher network.